ICESat-2 carries a single instrument – the Advanced Topographic Laser Altimeter System, or ATLAS. Like the altimeter on the first ICESat mission, ATLAS measures the travel times of laser pulses to calculate the distance between the spacecraft and Earth’s surface. ATLAS will feature new technologies that will allow it to collect a more detailed, precise picture of the heights of the planet’s ice, vegetation, land surface, water and clouds. As it orbits over the poles, ATLAS has three major tasks: Send pulses of laser light to the ground, collect the returning photons in a telescope, and record the photon travel time. ATLAS carries two lasers, one primary and one backup. The laser light is at 532 nanometers, a bright green on the visible spectrum. It is fast-firing – it sends 10,000 pulses per second, as compared to the laser on the first ICESat, which sent 40 pulses per second. With this incredibly fast pulse rate, ATLAS can take measurements every 2.3 feet along the satellite’s ground path. Before ICESat-2's laser photons beam down to Earth, they first complete an obstacle course through the satellite's instrument, ATLAS. ICESat-2's laser beam has to make several turns as it travels through ATLAS, as seen in this illustrated image. The pulses of light travel through a series of lenses and mirrors before beaming to the ground. This pathway along the optical bench serves to start the stopwatch on the timing mechanism, check the laser's wavelength, set the size of the ground footprint, ensure that the laser and the telescope are perfectly aligned, and split the laser into six beams. About 20 trillion photons leave ATLAS through its box structure with each pulse; only about a dozen return to the satellite’s telescope. 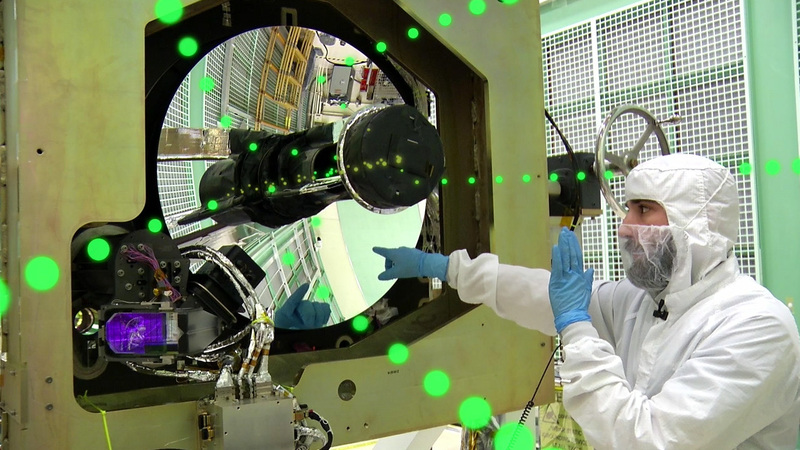 To catch these photons, ATLAS is equipped with a beryllium telescope, 2.6 feet in diameter. To ensure that the telescope is aligned with the returning photons, ATLAS engineers have designed and built the Laser Reference System. 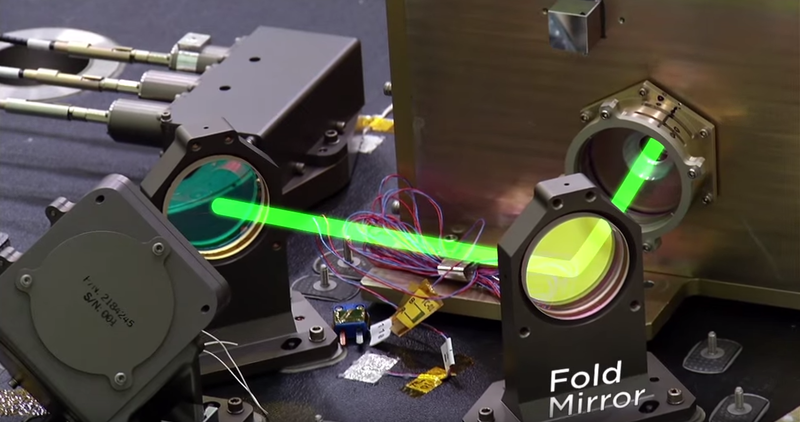 This device picks up a fraction of the laser light before it leaves the satellite, and compares the laser positioning to the positioning of the telescope. A steering mechanism then moves the laser beam, if needed. ICESat-2's laser beams and telescope need to align exactly to collect measurements - this video demonstrates how engineers accomplish this task. The photons that return to ATLAS’s telescope are focused on six fiber optic cables in the focal plane, corresponding with where the six laser beams will return. From those fibers, the photons pass through a series of filters, which only let through light that is at precisely 532 nanometers. The filters are key to preventing sunlight that naturally reflects off Earth from swamping the detectors. 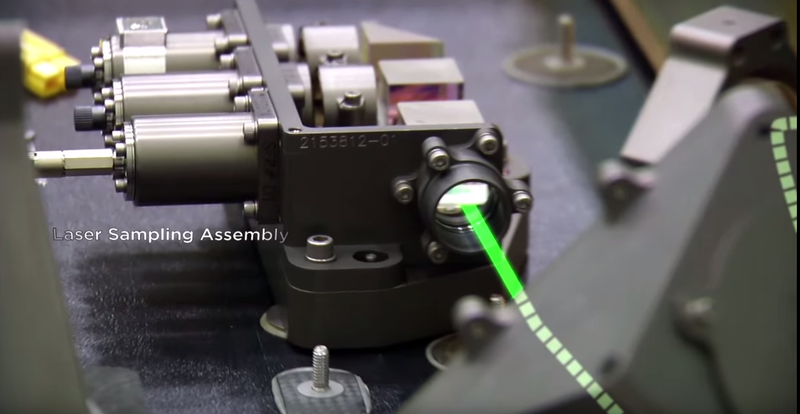 When an individual 532-nm photon makes it through the filters, it triggers the detector. The timer, which started when the laser left the satellite, stops. The telescope on the ATLAS instrument is just one part of the receiver assembly that collects returning photons. 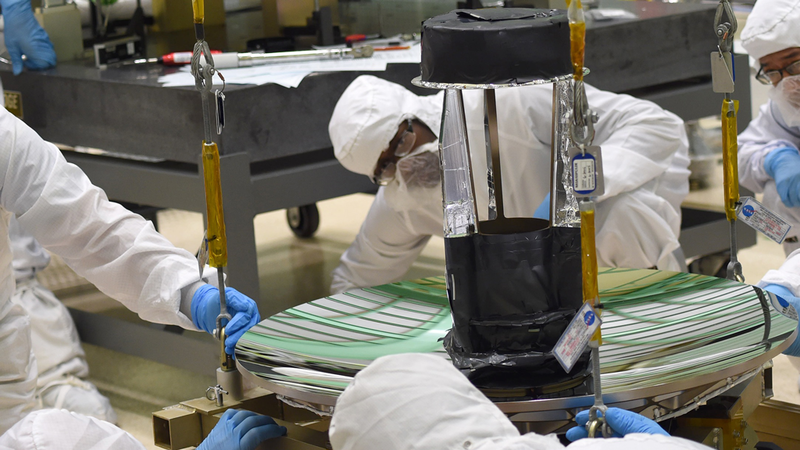 The time-tagged piece of data about each returned photon is communicated to the electronics and communication system on ICESat-2’s spacecraft and sent to the ground. Computer programs can take that travel time and satellite position, do a calculation involving the speed of light, and tell researchers the distance the photon traveled. The trip from ATLAS to Earth and back takes about 3.3 milliseconds, give or take a microsecond. One data point isn’t sufficient to determine elevation, however. ATLAS will pick up a significant amount of background photons: sunlight in the 532 nanometer range will set off ATLAS’s photon detectors, and particulates or clouds in the air could skew ground data. So computer programs will create "photon cloud" graphs, showing thousands of data points returned by the instrument. 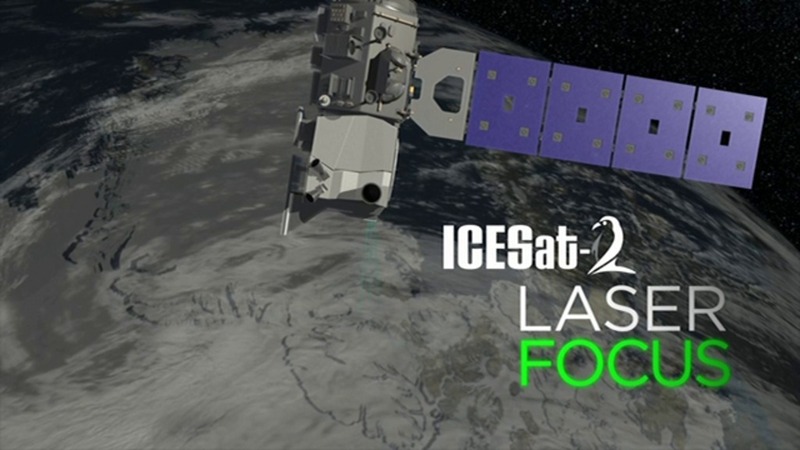 Only by applying additional computer programs, which look for the stronger signals in the background clouds, will scientists determine the elevation of the ice, land, water and vegetation below ICESat-2.